Installing a stairlift in your home is usually a day of joy and anticipation. 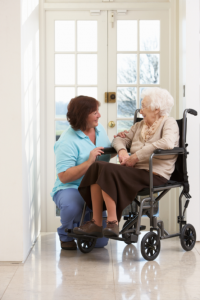 Being able to freely move between floors has given our customers a new level of independence that their health or injury had been preventing. While a stairlift installation can be done on your own, The Accessibility Equipment Manufacturers Association advises against it, mainly for safety reasons. Inexperienced installers can put you and your family’s safety at risk, not only as users of the device, but also being around it in the home if it is installed incorrectly. Before we proceed with the installation, we will come to your home and discuss the best option for you. The perfect stairlift will be chosen based on your needs. While the stairlifts themselves seem intimidating to put into your home, we make installation an easy process that is done within a single day, usually within a matter of hours. Many of our customers are surprised at how easy it is to get it installed by one of our experienced team members, instead of attempting to do it themselves. Our customers also appreciate the usage guidelines and safety tips we provide during each stairlift installation, as it allows them to ensure they are using their new stairlift in a safe and efficient way. During the stairlift installation process, tracks are secured to your stairs on supports that are strong enough to carry the stairlift and it’s passenger. In most cases, your handrail will remain in place, unless it interferes with the stairlift track or passenger safety in any way. Additionally, the lifts are not attached to the wall in most cases, making it extremely useful to have the stairlift removed when it is no longer needed. Removal by our experienced team usually takes 1-2 hours, depending on configuration. The stairlifts we carry are designed to take up as little room as possible, while still maintaining a sense of comfort, freedom, and safety. When it comes down to it, the Williams Lift Company is proud to give you and your family a product that will help make your home a place where you can feel happy, relaxed, and independent. Our installation process was designed to be as easy as possible so you can begin enjoying your new stairlift the same day it is installed. If you’d like to learn more about stairlift installation in New Jersey, please call us today for a free estimate or brochure at 908-322-7070.